Multirotors (drones) are this years big imaging buzz, enabling you to capture shots that would otherwise be impossible. 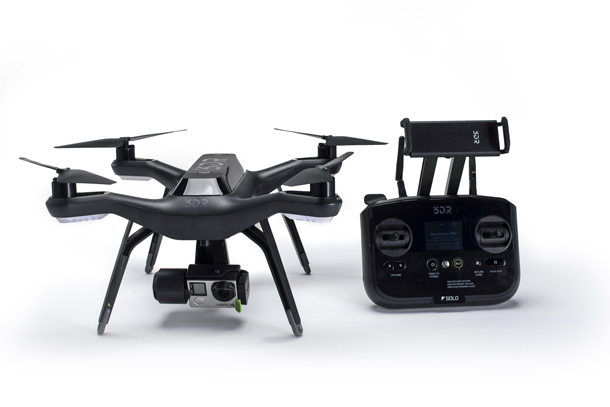 The 3DR SOLO – price £1358 | $1399 – is one of only a few serious imaging multirotors available at present as most others are really designed for RC enthusiasts. What makes the SOLO different is that it has a host of features that make it both easy to fly and capture stunning imagery. These flight and imaging features are of course available on other multirotors, most notably the popular DJI Phantom 3 series, but the SOLO’s approach is altogether more refined from the aesthetics to the operation. The first point to note is that the SOLO looks like a series piece of kit, with the black body and well weighted and solid build, the design is functional for the photographer and has not been designed purely for the drone hobbyist. At the moment there is a trend for fully integrated systems with the likes of Parrot, DJI and Yuneec all featuring their own built in camera technology, however the SOLO is one of the few multirotor’s to still utilise the power of GoPro. This integration enables you to take advantage of the GoPro’s tried and tested image quality and enables the use of video capture features such as 4K and Full HD at 120fps. One of the advantages of the fully integrated camera systems has been that they can be controlled from the ground by means of an app, and this integration has been replicated with the GoPro and 3DR SOLO. This connection is made possible by the motorised gimbal which is an optional extra, but once attached the gimbal enables full streaming live view video as well as the ability to adjust settings and switch modes. 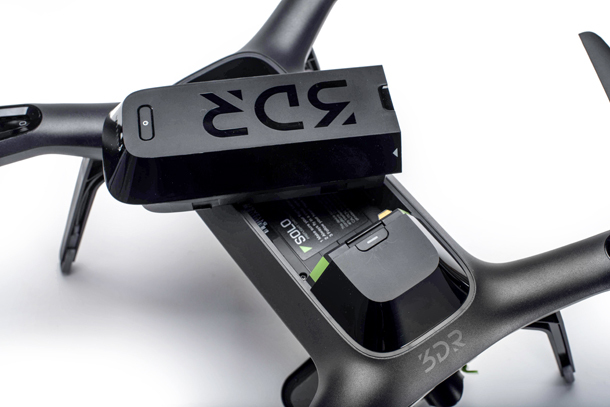 The handset is of the usual two stick type with a wireless connection that enables you to connect to the drone through a mobile app, this app is available for both iOS and Android devices. The app gives you access to intelligent flight features such as Cable Cam, Orbit and Follow me, as well as live view and cameras adjustment. The handset and app also feature a variety of other handy flight features designed to make the SOLO one of the easiest multirotors to operate, with auto takeoff and landing as well as the all important return to home feature. The 3DR SOLO is by no means the cheapest imaging multirotor on the market, with an initial outlay for the multirotor, then extra for the motorised gimbal and GoPro, but for that money you get solid reliable multirotor that will enable you to capture images like never before.